Making a kazoo out a comb is a quick, easy and inexpensive musical instrument project. Any type of comb can be used for varied results, although the traditional kazoo comb uses the old-fashioned black plastic pocket comb. Making a comb kazoo with children can also double as a science experiment in learning about sound vibration and energy transfer. The energy of the humming sound of the mouth is transferred to the paper of the kazoo, causing it to vibrate and reproduce sound. Cut a piece of wax paper about 2 inches square. Depending on the size of the comb, the paper should be slightly smaller than the length of the comb and twice the size of the comb's height. 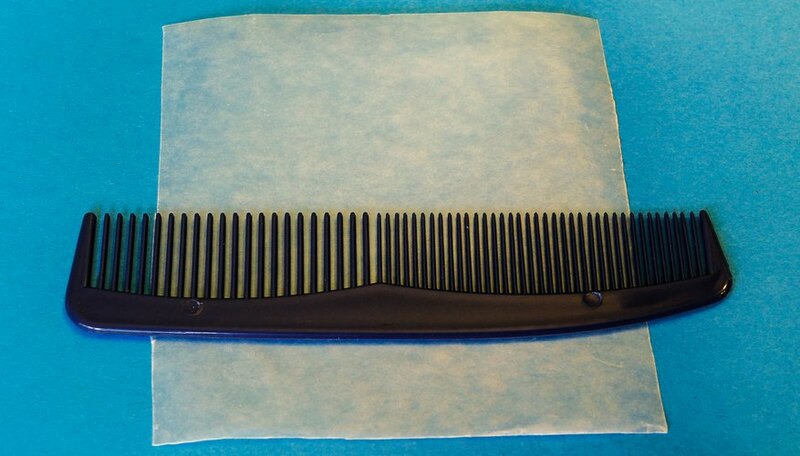 Fold the wax paper in half and place the folded seam over the exposed teeth of the comb, approximately in the center. 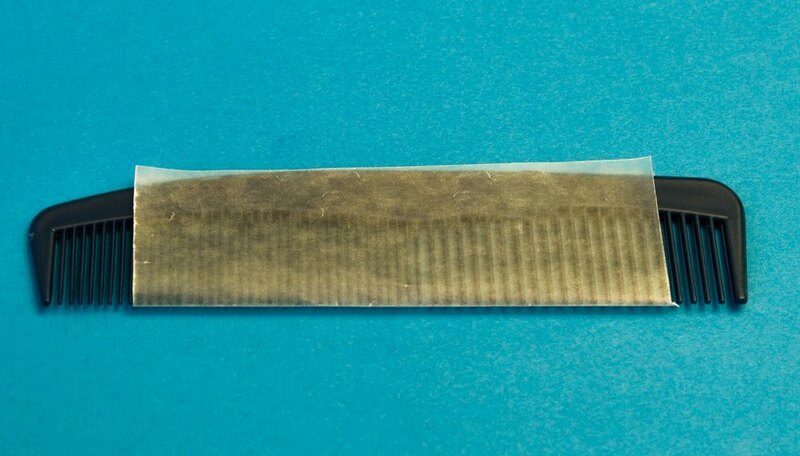 There should be one layer of wax paper on each side of the comb, with the ends of the paper extending to the comb bottom. 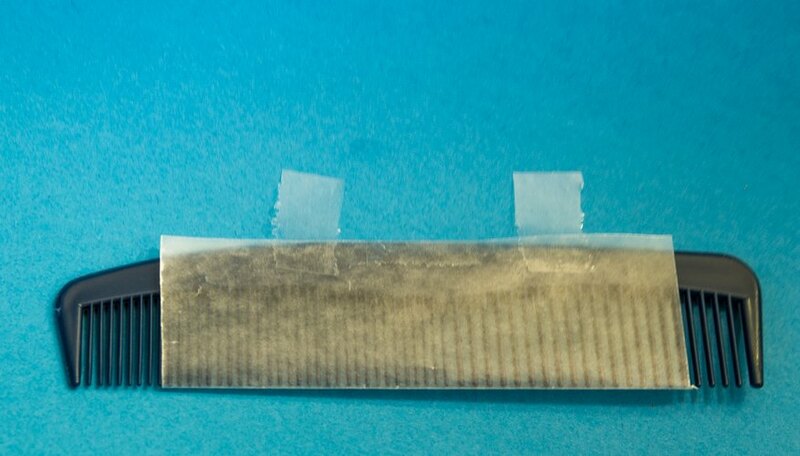 Place a small piece of transparent tape at the bottom of the folded wax paper to secure it to the comb. This step is optional, but don't stretch the wax paper too tightly with tape, as it may affect its vibration. Place dry lips against the wax paper and hum to produce sound. A little experimentation will different humming sounds may be necessary, such as "mmm" or "dooo" sounds. Adjust the wax paper tension if necessary to adjust sound quality. Try using different weights and types or tissue paper, wrapping paper and wax paper for different sounds. Humming into the kazoo, rather than blowing or singing, will yield the best sound. Avoid getting the tissue wet, as the vibrating and sound qualities will be affected. Use recycled wax paper from cereal boxes, old gift wrap or gift-wrapping tissue. Supervise young children when using scissors. Safety scissors are recommended.